When it comes to web server software, Apache has been king of the hill for a long time. It currently has about 54% of the market. This is followed by Microsoft’s IIS, with about 24% of the market. Then, surprisingly, a new contender has started to rise, and it’s coming out of Russia: nginx (pronounced “engine x”). According to Netcraft, 7% of all websites on the internet are now using nginx. This is all the more amazing when you consider that nginx was developed by just one person. We have taken a closer look at this shooting star on the web server heavens and how fast it’s growing. We have also spoken directly with Igor Sysoev, its creator (Q&A further down), to get the inside scoop on what is happening with nginx right now. What is nginx, and who uses it? Nginx is a fast, light-weight web server that can also be used as a load balancer and caching server. It’s been written to be able to handle an extremely large number of simultaneous connections in a very efficient manner. To be able to scale efficiently, nginx does things a bit differently than most web servers. For one, it doesn’t rely on threads to handle requests. Instead it uses a highly scalable asynchronous architecture which makes it possible for it to handle thousands of requests at once without using up a lot of system resources. Nginx is free and open source, which has made it an easy option for those looking for a small, high-performance web server. It doesn’t necessarily have to be used on its own, and many sites use it together with for example Apache for specific tasks. Nginx was developed by Igor Sysoev for use with one of Russia’s largest sites: Rambler (a web portal). He started developing the software in 2002, but the first public release wasn’t until 2004. The popularity of nginx has since exploded and it’s now used by millions of sites. A few prominent sites that use nginx in one capacity or another are WordPress.com, Hulu, and SourceForge. Nginx has been growing consistently from year to year, and its momentum has been increasing. 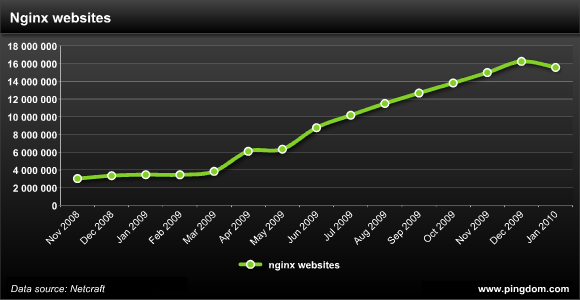 The number of websites using nginx grew by 384% in 2009 and 337% the year before that. If you look at growth in terms of percent, nginx has been crushing every other web server out there. In terms of absolute number of websites, nginx added 12.9 million websites in 2009. It even kept pace with Apache’s overall growth for most of the year, some months even surpassing it. As a comparison, Apache grew by 13.3 million websites in 2009. In the above chart, the slump you see at the beginning of 2010 is apparently due to long-unused blogs being removed from WordPress.com and the Chinese 163.com. Currently, just under 16 million websites are using nginx. If the yearly growth rate (in percent) remains the same in 2010 as in 2009, nginx will end up on more than 75 million websites by 2011. That would be an incredible feat, and although that prediction may be a bit optimistic, we would be highly surprised if nginx doesn’t grow significantly over the coming year. Nginx isn’t just growing in terms of websites, the buzz around it is increasing as well. If we use search volume on Google as an indicator for this, we see that searches for nginx have been rising steadily over time. It’s also been getting more and more news coverage, as you can see by the below Google Trends graph. This increased interest in nginx is bound to feed on itself and as nginx gains more visibility, more people are likely to try it out. Pingdom: How many developers are working on nginx? Sysoev: I’m the only developer of nginx. There are also some patch contributors, the most active of them being Maxim Dounin. In addition to this, there are developers working on third-party modules. Pingdom: What’s the most common use of nginx today? Pingdom: How many use nginx as their main web server as opposed to a load balancer? Sysoev: I don’t know, but I believe nginx is used more often as a proxy than as a main web server. Pingdom: Why do you think nginx is growing so fast? Sysoev: It’s really been a surprise to me. First, it’s a free software. This is why it’s more popular than commercial servers such as Zeus and LiteSpeed. users have switched to nginx. Nginx got mentioned in printed books, mostly Ruby on Rails related. Pingdom: What’s next for nginx? Pingdom: Where do you think nginx will be in 5 years? Sysoev: I really have no idea. As large websites look for more efficient ways to handle their massive traffic, they are bound to start eyeing optimized solutions such as nginx to help them scale, just like Automattic has done with WordPress.com. Nginx also has a growing community behind it, documentation in several different languages (originally this was a problem, because the documentation was at first only available in Russian). There’s even a helpful wiki with plenty of information and resources to help webmasters, sysadmins and web developers to get started. We here at Pingdom suspect that nginx is marching into a very bright future. I run NGINX on my VPS, as Apache+mod_php was too heavy for my 256MB of RAM. It works like a charm, though it was a bit more difficult to set up than Apache. Over the paste 2 years I have moved all my websites from a combination of Apache and lighttpd to Nginx and it simply rocks. I am not sure why there is always “Where do you think xxxx will be in n years?” type of question, because as it is for now, Nginx is perfect for all my uses. Don’t want to see a good, small and extremely fast webserver going down the same bloat path as Apache. I built a surf report site using NGINX because it needed to be fast and scale, configuration was simple and .htaccess rules can be converted. I choosed Lighttpd over Apache, years ago. It was 1.2 if I recall. I used it first to serve static then as the only webserver. I stuck with it until last year when I wanted to try Nginx. I used on our main webserver and it rocks. I come back to Lighttpd for another project as I found the configuration part a little more user friendly. In the future I’m going with Nginx again until Lighttpd 2.0. I’ve been using Nginx on one of my largest web properties, RolePlayGateway. We have an AJAX-powered chat that runs over HTTP, and performance is a real concern. After Apache’s utter meltdown, we tried Lighttpd for quite some time, but it just caused so many problems (we had to set up a cron job to restart it on 1 minute intervals to keep it online!) that we finally switched over to Nginx. Things have been running perfectly ever since, and at a 30% performance increase over Lighttpd. Good stuff. I love nginx, for high level of customization. Great against DDoS attacks and with clever configuration u can increase your web project security. Also great tool for serving static data and fail over clustered systems. I was reaching capacity of my 1gb VPS RAM quota running Apache2, PHP, PostgreSQL. There were 40 apache processes each weighing 15-20mb averaging 600-700mb RAM. I just installed NGINX in front of Apache in a reverse proxy config. NGINX serves all static content (JS, CSS, Images) and proxies PHP requests to Apache/mod_php. Its amazing how efficient this setup is! Server now has just 15 * 15mb Apache processes (average 225mb RAM) and 4 * NGINX processes (3mb RAM). Net result: capacity for 3x as many concurrent requests / vistors! I Really need and will change to Nginx soon! I preconfigured the latest nginx, php, and mysql releases into an installer so everyone can try nginx in all it’s glory! I use it for my blog network. Millions of pages without any problems. I was playing with “top” and I was surprised to see Nginx serves my blog posts in less than 1/100th of second. I’m on a $20 Linode account, if you’re wondering. It’s fast! my boss has told me to start researching nginx.. I’m wondering if anyone has a link to any video tutorials? Or walk throughs? I tried on youtube and there is nothing really there… I just want something simple to show my boss. I am new to Ngnix and came to know its advantages. I am going to use this server for my web applications.. Thanks for the person who invented it…. I love Nginx, Thank you! I have 1 dedicated server and 1 droplet (1Gb RAM, 2vcpu). On my dedicated server, I use apache + Nginx. It works well and fast (for example site from dedicated server: seodima.com). On small VPS, I use Nginx + PHP-fpm and it’s very very fast (example site from small droplet: singapore-schools.com). But I think NGINX must be more user-friendly in configuration.